Edward D. Tracy (1833-63), Brigadier General, CSA (Alabama). 1st Manassas, Shiloh, Port Gibson (KIA). "...I was engaged to make a political speech at night and thought it might be agreeable to you to hear how I acquited myself on the occasion. I wish now I had not delayed for to tell you the truth, I do not think my speech was worthy of a future President of the United States...Edw. D.Tracy". 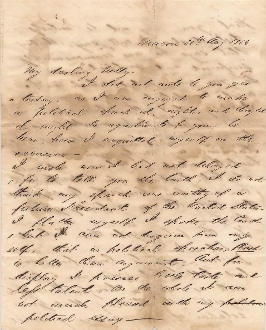 Autograph Letter Signed (ALS), 4 pages, Macon (Georgia), 30th Aug., 1856. For background information and transcription of the letter, please see the scan. Aging, otherwise dark ink and legible, Rare autograph.